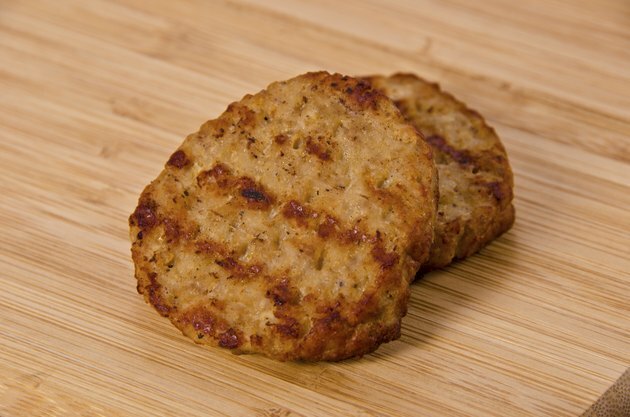 Sausage patties can be made from many types of meat, including pork, beef, chicken or turkey. They consist of ground meat - often a variety with a high fat content - that is mixed with seasonings and formed into patties. These patties are easy to cook because the fat content serves as a natural grease and keeps the patties from sticking to the surface of a frying pan. Sausage patties can be served with any meal but are most commonly served for breakfast, and almost anyone can cook them without any trouble. Preheat your stove top frying pan to medium heat. Place a small amount of cooking oil, about 1 teaspoon into the pan and let it heat up. Place your sausage patties in the preheated frying pan and cook them for three minutes per side, flipping once. The sausage should turn a pale golden brown color if it is pork, which is the most common type of meat used to make sausage. Transfer the sausage patties to the oven, keeping them either in the frying pan or placing them onto a baking sheet. Bake the patties for another five to seven minutes in the oven to give them a crunchy crust, then remove and serve. Pull the sausage patties from the heat source if they start to blacken on their exteriors. This means you have overcooked the meat, and the blackening will dry out the sausage. Eating a sausage patty that is not fully cooked may lead to illness, according to the Centers for Disease Control. Symptoms of trichinosis include nausea, vomiting, fever, fatigue, itchy skin, chills and diarrhea. Internal sausage temperature must reach 160 degrees and color should no longer be pink.